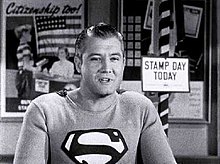 Although Superman was not the first superhero character, he popularized the superhero genre and defined its conventions. He remains the best selling superhero in comic books of all time  and endured as one of the most lucrative franchises even outside of comic books. In June 1935 Siegel and Shuster finally found work with National Allied Publications, a comic magazine publishing company in New York owned by Malcolm Wheeler-Nicholson. Wheeler-Nicholson published two of their strips in New Fun Comics #6 (1935): "Henri Duval" and "Doctor Occult". 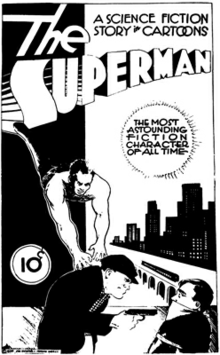 Siegel and Shuster also showed him Superman, and asked him to market Superman to the newspapers on their behalf. 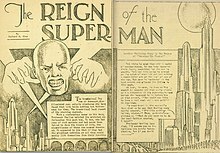 In October, Wheeler-Nicholson offered to publish Superman in one of his own magazines. Siegel and Shuster refused his offer because Wheeler-Nicholson had demonstrated himself to be an irresponsible businessman. He had been slow to respond to their letters and hadn't paid them for their work in New Fun Comics #6. They chose to keep marketing Superman to newspaper syndicates themselves. Despite the erratic pay, Siegel and Shuster kept working for Wheeler-Nicholson because he was the only publisher who was buying their work, and over the years they produced other adventure strips for his magazines. 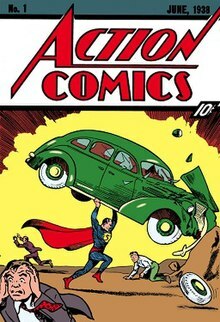 Superman was finally published on April 18, 1938, in the first issue of Action Comics, which was a huge success thanks to Superman’s feature. 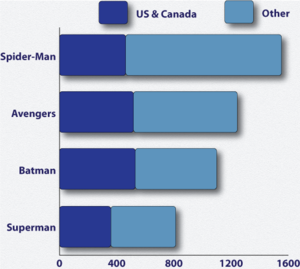 ^ a b "Best-selling comic books of all time worldwide as of February 2015 (in million copies)". Statista. Retrieved July 30, 2018. ^ Carol Tilley (March 1, 2016). "Unbalanced Production: The Comics Business in the 1940s". The Beat. Retrieved July 30, 2018. 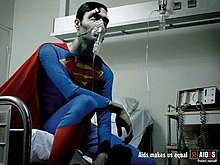 ^ "Thesp trio eyes 'Nurse'; 'Superman' may fly". Variety.com. September 29, 1998. ^ Beeler, Stan (2011). "From Comic Book To Bildungsroman: Smallville, Narrative, And The Education Of A Young Hero". In Geraghty, Lincoln (ed.). The Smallville Chronicles: Critical Essays on the Television Series. Scarecrow Press. ISBN 9780810881303. ^ Moore, Bryan. "Top 10: Superhero Logos". AskMen. Retrieved April 5, 2019. ^ Hirofumi Katsuno (2018). "The Grotesque Hero: Depictions of Justice in Tokusatsu Superhero Television Programs". In Alisa Freedman; Toby Slade (eds.). Introducing Japanese Popular Culture. Routledge. ISBN 9781317528937. ^ "Retail Sales of Licensed Merchandise Based on $100 Million+ Entertainment/Character Properties". The Licensing Letter. July 23, 2018. Retrieved August 7, 2018. ^ Ian Anthony (November 2003). "Superb Manifestations: Five Anniversaries Converge In 2003 For Superman". Superman Homepage. Retrieved August 7, 2018. ^ Eco, Umberto (2004) . "The Myth of Superman". In Jeet Heer; Kent Worcester (eds.). Arguing Comics. University Press of Mississippi. p. 162. ISBN 1-57806-687-5. ^ Peter Coogan (2013). "The Hero Defines the Genre, the Genre Defines the Hero". In Robin S. Rosenberg; Peter MacFarland (eds.). What is a Superhero?. Oxford University Press. ISBN 9780199795277. June 1938 (See also: Origin of Superman, Krypton, Kryptonian, Superman dynasty, Superman logo, Clark Kent, Daily Star (DC Comics), George Taylor (DC Comics), Lois Lane and Superman and Lois Lane) The character Zatara was debuted by Fred Gaudineer along with the first character named Tigress. See Zatara and Tigress (DC Comics) for more info and next timeline.